Discovered separately on 18 September 1965 by the Japanese astronomers Kaoru Ikeya and Tsutomu Seki 15 minutes apart, the C/1965 S1 comet was probably the brightest for a thousand years. It had a magnitude of 8 at the time of its discovery (and was therefore invisible to the naked eye) but orbital calculations showed that it was going to pass very close to the Sun, at only 450,000 kilometres and that it would therefore be very bright. Sure enough, when it passed its perihelion on 21 October 1965, it was visible in broad daylight near the Sun with a magnitude of -10, almost equivalent to a full Moon! Because it passed very close to the Sun, the comet broke up into three pieces that followed each other on similar orbits. 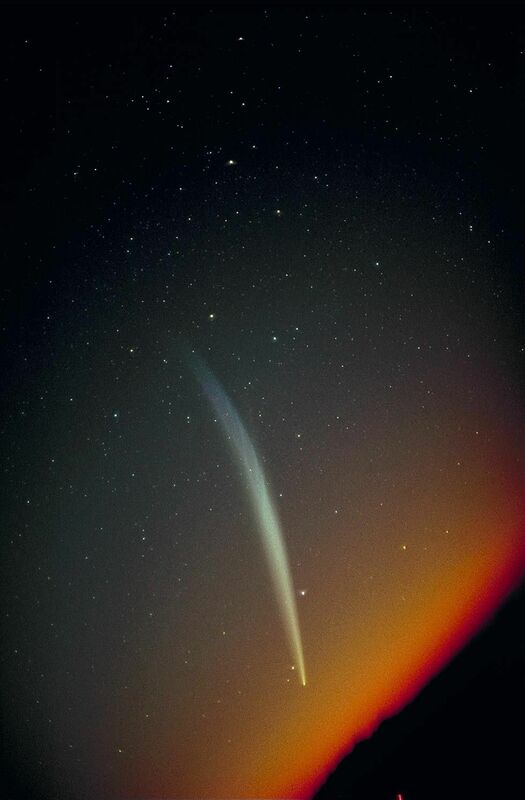 At the end of October the comet became visible before dawn, offering a view of its very bright and majestic tail on an apparent length of 25 degrees. C/1965 S1 is one of the members of the Kreutz group. This is a group of comets that come very close to the Sun, making them very bright. At the end of the 19th century, it was the German astronomer H. Kreutz who showed that each of these comets was actually a piece of a large comet that broke up in 1106 when it passed close to the Sun after having been seen in broad daylight in Europe.